Surf News Network, 26 March, 2015. The nominees for the 2015 World Surf League (WSL) Big Wave Awards have been announced. With hundreds of entries for this year’s awards from all over the world the standard is incredibly high. From a winter session at Jaws, Maui to a huge day in Nazaré, Portugal, the extraordinary weather conditions over the last year have generated some outstanding nominees from the world’s best big wave surfers. Shortlisted surfers include past winners like Shane Dorian of Hawaii and Grant Baker of South Africa, as well as emerging stars like Tahiti’s Matahi Drollet. The 15th annual Big Wave Awards are a truly global event with Portugal, Germany, Australia, South Africa, USA, Mexico, Peru, Chile, and Tahiti all represented, either by surfer nationality or wave location. “It was another spectacular year of big wave surfing, all around the globe and might even be the most international season ever in the fifteen years since I started the Big Wave Awards,” said Bill Sharp, Event Director of the Big Wave Awards. Now check this Vid out of Dean Morrison and tell me this isn’t alittle bit ground breaking…if not back breaking. For sure it’s one of the biggest baddest right hand tubes ever made. SNN. The WSL Big Wave Awards competition window ran from March 20, 2014 until March 20, 2015 with every wave ridden at every big wave break around the world in that period eligible for consideration across seven diverse award categories.The five biggest or best in each of the categories have now been chosen by a panel of judges based on the photographic and video evidence, and the winners will be crowned at a gala awards show at the Grove Theater in Anaheim, California on May 1. There is over $120,000 in prize money up for grabs and nominees in four of the categories are announced today, leaving the Wipeout of the Year and two performance categories to be announced in the coming weeks. Photographs and video of all the nominated rides can be viewed at WorldSurfLeague.com/BigWave. The highly coveted Billabong Ride of the Year is awarded to the individual surfer who demonstrates the most advanced and committed level of big wave surfing during a successful ride, as judged by available video footage. While raw size does count, it is ultimately the level of performance that is rewarded and the category carries $50,000 for the winner, $5,000 for second place, $1,500 for third, fourth and fifth place and a videographer prize of $5,000. Three of the five nominated rides took place on July 5, 2014 at Puerto Escondido, Mexico including entries from 2014/2015 WSL Big Wave Tour runner up Gabriel Villaran from Portugal, 2013 Ride of the Year winner Shane Dorian (who has a second nomination in the category from Jaws), and Florida’s Brad Domke on a finless skimboard. The remaining entrant is Dean Morrison for an impressive ride at Western Australia’s The Right. Brad Domke (Wabasso Beach, Florida, USA) at Puerto Escondido, Mexico on July 5, 2014. 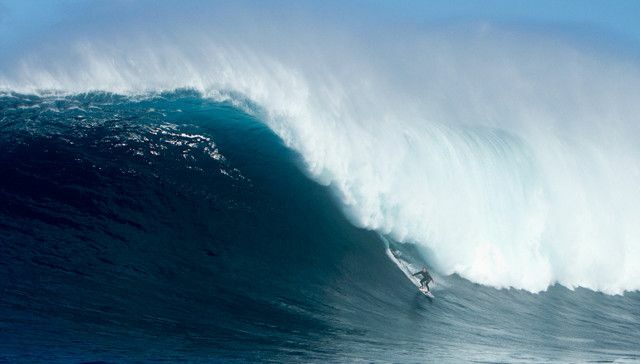 Shane Dorian (Kona, Hawaii, USA) at Jaws, Maui, Hawaii on November 12, 2014. Shane Dorian (Kona, Hawaii, USA) at Puerto Escondido, Mexico on July 5, 2014. Dean Morrison (Gold Coast, Australia) at The Right, Australia on April 18, 2014. Gabriel Villaran (Punta Hermosa, Peru) at Puerto Escondido, Mexico on July 5, 2014. The Paddle Award goes to the surfer who paddles into the biggest wave of the year. The prize is $20,000 for the surfer and $4,000 for the photographer who captures the ride. 2013/14 Big Wave Tour Champion Grant “Twiggy” Baker of South Africa is nominated twice in this category, for rides at Jaws and Pico Alto in Peru, while Australia’s Jamie Mitchell and Californian charger Nic Vaughan are both nominated for huge performances at Maverick’s, California. Former Championship Tour competitor Damien Hobgood from Florida, USA, rounds out the nominations for this category with his wave at Punta de Lobos, Chile. Grant Baker (Durban, South Africa) at Jaws, Maui, Hawaii on November 12, 2014. Grant Baker (Durban, South Africa) at Pico Alto, Peru on July 3, 2014. Damien Hobgood (Satellite Beach, Florida, USA) at Punta de Lobos, Chile on May 5, 2014. View Point: We’re glad that surfers are able to get nominated even if they don’t make the entire wave. The essentials are all here. This is awesome to see Damien Hobgood entering this Big arena. SNN. Jamie Mitchell (Gold Coast, Australia) at Maverick’s, California on December 20, 2014. Nic Vaughan (Rancho Palos Verdes, California, USA) at Maverick’s, California on December 20, 2014. The XXL Biggest Wave Award goes to the surfer who, by any means available, catches and successfully rides the biggest wave of the year. There is a prize of $10,000 for the winning surfer and $4,000 for the photographer. Shortlisted entries include three incredible moments from the same huge day at Nazaré, Portugal, including rides from former Biggest Wave Award winner and German tow surfer Sebastian Steudtner, 2001 Quiksilver in Memory of Eddie Aikau winner and surfing legend Ross Clarke-Jones of Australia and local Portuguese up-and-comer Hugo Vau. The remaining two entries are from Aussies Mick Corbett and Jarryd Foster at Cow Bombie off the coast of Western Australia. Ross Clarke-Jones (Avoca Beach, New South Wales, Australia) at Nazaré, Portugal on December 11, 2014. Mick Corbett (Perth, WA, Australia) at Cow Bombie, Australia on August 9, 2014. Jarryd Foster (Dodges Ferry, Tasmania, Australia) at Cow Bombie, Australia on August 9, 2014. Sebastian Steudtner (Nuremberg, Germany) at Nazaré, Portugal on December 11, 2014. Hugo Vau (Terceira, Azores, Portugal) at Nazaré, Portugal on December 11, 2014. The surfer who rides the single most spectacular barreling wave of the year wins the Tube Award, judged on the impact generated by still photo images. There’s $5,000 for the surfer and $2,000 for the photographer. The Australian slab, The Right, generated three of the 2015 nominations with rides from Dean Morrison (who is also nominated in the Ride of the Year category), Brad Norris and Chris Ross, all from Australia. Tahiti’s Matachi Drollet, brother of local legend Manoa Drollet, also made the cut after towing into a huge pit at Teahupo’o at the age of just 16 and is joined in the shortlist by Mick Corbett for his massive blue tube at Cow Bombie. Matahi Drollet (Tahiti, French Polynesia) at Teahupoo, Tahiti on September 11, 2014. Brad Norris (Perth, WA, Australia) at The Right, Australia on April 18, 2014. Chris Ross (Margaret River, WA, Australia) at The Right, Australia on April 18, 2014. Judges will review the nominated rides and the winners will be revealed at the invitation-only WSL Big Wave Awards ceremony at the Grove Theater in Anaheim, California on May 1, 2015. The show will be webcast live on WorldSurfLeague.com and a highlight show broadcast on ABC-TV in the US in June and additional networks worldwide. The remaining three awards, the Wipeout of the Year, the Surfline Best Overall Performance and the Women’s Best Performance will be announced in early April.